Compared to other types, the superiority of lang lay rope in certain applications derives from the fact that when bent over sheaves, its life span is longer than the others. Stated in another way, the advantage of lang lay rope is its greater fatigue resistance. Yet another claim is made for lang lay ropes: they are more resistant to abrasion. Broadly speaking, this is true, but there are some reservations that should be taken into account. It is important to understand the reasons for the advantages of lang lay rope. To begin with, consider its fatigue and bending properties. Figure 4A shows, in part, how the lang lay construction characteristics result in greater fatigue resistance than is found in regular lay rope. Note how the axis of the wire relates to the axis of the rope in both cases. When the regular lay rope is bent, the same degree of bend is imparted to the crowns of the outer wires. 15 to 20% superiority over regular lay when bending is the principal factor affecting service life. It is said that lang lay is more flexible, but flexibility should not be confused with fatigue resistance. These two attributes may, under certain circumstances, bear some relationship, but they are distinctly separate characteristics. Flexibility defines the relative ease with which a rope “flexes” or bends. Fatigue resistance defines the rope’s ability to endure bending. Figure 4A. 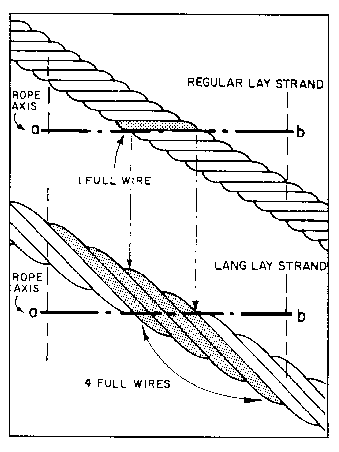 A comparison of wear characteristics between regular lay and lang lay ropes. The lines a-b, on drawings and photographs, indicate the rope axis. Figure 4B. The worn crown of the regular lay wire has a shorter exposed length. Two other factors relate to fatigue; they are discussed here along with abrasion and peening characteristics.